Dr. G.P.Ganapathy, graduated from the College of Engineering Guindy, Anna University, Chennai, India in the year 1997 and completed his Masters from the Same University in Applied Geology Discipline. He completed his Doctoral Research in Earthquake Microzonation for Chennai City at Anna University, Chennai, India. Dr.Ganapathy served for Centre for Disaster Mitigation and Management, Anna University, Chennai for 8 years as a Scientist and carried out research studies the field of earthquake hazard assessment, earthquake monitoring, seismic micro-zonation, landslide hazard zonation, liquefaction hazard mapping, soil bio engineering for slope stabilization, environment impact assessment and management. Later on he moved to Centre for Disaster Mitigation and Management, Vellore Institute of Technology (VIT), Vellore, Tamil Nadu, India. Dr. Ganapathy published more than 50 research papers in reputed International/National journals, and presented 30 papers in International and National workshops / conferences and he is Managing Editor and Editorial Board Member for 8 International Journals. Dr.Ganapathy creating awareness on Disaster Education to the public and scientific community across the globe, through various lectures for the last 12 Years. Dr. Ganapathy visited 10 countries including United States & Europe and presented various lectures on Disaster Mitigation and Management. Dr. Ganapathy is the member for the State Disaster Management Plan Core group, State Early Warning Committee Member, and Consultant for preparation of District level Multi-Disaster Plan, Government of Tamil Nadu. 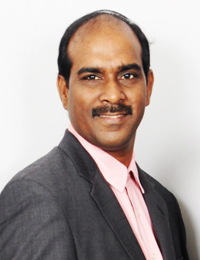 Dr. Ganapathy is the nominated member for the Disaster Management Agency, Vellore District. He is also the member for District Environmental Appraisal Authority (Vellore and Thiruvannamalai Districts), District Expert Committee member Major Hazardous Industries. Dr. Ganapathy is the honorary member in the Joint Working Group for Geotechnical Disaster Management, Sub Committee member for Confederation Industry India (CII), South India for Disaster Management, and member in many scientific societies. He is the nominated member for the creation of Disaster loss database for Tamil Nadu State by UNOPS, Geneva. Dr. Ganapathy is the invited member of Working Committee on Landslide Hazard Mitigation, formulated by the National Disaster Management Authority, Government of India. Dr.Ganapathy contributed to the Global Assessment Report 2011 on Disaster Risk Reduction. He offered technical support in two major publications published by Government of India viz. Seismic Micro-Zonation methodology, Landslide Hazard Zonation Atlas of India. Dr. G.P.Ganapathy, Received Special Award for the contribution to District Disaster Management Authority (DDMA), Vellore and received various fellowships viz., United Nations Office of the Outer Space Affairs, Vienna Fellowship, INAE Fellowship for mentoring Faculty in Landslide Disaster Risk, International Network of Crisis Mappers (Crisis Mappers Net)- ICCM Fellowship 2016 etc. Dr. Ganapathy handled 10 funded research projects and more than 30 Consultancy projects on Disaster Mitigation and Management and Mining. His recent funded research projects are Development of Early warning System for shallow landslides, funded by ISRO, and Updating the loss database for the state of Tamil Nadu funded by UN –ISDR, Geneva. At present Dr.G.P.Ganapathy is working as Professor & Director at Centre for Disaster Mitigation and Management, Vellore Institute of Technology (VIT), Vellore, Tamil Nadu, India.